Labour must undergo "seismic shifts" to reconnect with its traditional supporters and avoid becoming "irrelevant", one of its MPs says. 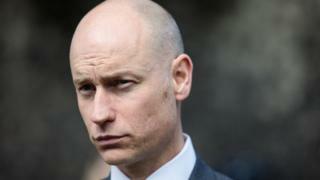 Stephen Kinnock has edited a new book with fellow Labour MPs setting out policies they say will "bridge the divide" between communities. Mr Kinnock says Labour has "fundamentally failed to reinvent itself." The MPs' proposals cover housing, education, social cohesion and health. Jeremy Corbyn's office declined to comment on the publication. Speaking at the book launch, Mr Kinnock - a frequent critic of the Labour leader - attacked the "hard left" within the party which he claimed did not "believe in Britain". He said that without change, Labour would become a "Marmite, love us or hate us party" which was irrelevant to most people. The MPs Emma Reynolds, Dan Jarvis, Anna Turley, Steve Reed and Justin Madders are among those who have contributed to the book, entitled "Spirit of Britain, Purpose of Labour". The policies put forward include adult education funds for people who don't go to university, government-funded training days for all workers and a decentralised national curriculum for schools. Baby boxes, already provided to prospective parents in Scotland, should be introduced UK-wide to help improve life chances and reduce infant deaths, claims Dan Jarvis MP, who has written a chapter on education. He suggests a new National Institute of Educational and Training Excellence should be given power to set the school curriculum. Among the housing policies suggested by the group are restrictions on foreign ownership, an overhaul of the land market and giving local authorities the power to speed up building. Labour's current target to build one million new homes by 2022 is "realistic albeit very ambitious," according to Emma Reynolds MP. She says the government's Rent to Buy and Help to Buy schemes had made the UK's housing problem "worse not better" and "helped stoke demand and done nothing to increase supply". In the book's foreword, Mr Kinnock says he hopes the Labour leadership will see the book as "a set of constructive proposals" which would "dramatically increase our changes of forming the next government". Speaking at the launch, he described a Britain as being in a "dangerously polarised state" and more divided than any time since the Second World War. In what appeared to be an attack on Mr Corbyn, Mr Kinnock said a minority within the party had a "conspiracy-driven world view". Those people, he said, saw Nato as a "warmongering junta" and were guilty of a "foot-dragging reluctance" to condemn Russia for the Salisbury attack. Asked if he thought Mr Corbyn himself believed in Britain, Mr Kinnock said "the jury is out" and described the party leader as being "on a journey." He added that Labour's 2017 general election result was encouraging, but that the party had struggled to win votes in its "communitarian heartlands." "We struggled amongst those who left school at 16, the over 50s and lost to the Tories in seats such as Mansfield and Middlesbrough." The result demonstrated the need for Labour to "return to the first principles of our foundation as a party", he added.